15 Spanish cities and places you must visit! The hot weather is fast approaching, so we’re already dreaming about the Summer holidays! Since we imagine you are planning your own vacay too, here are our (humble) suggestions about the best places to visit in Spain. From a Roman metropolis to Moorish strongholds, Medieval towns and the crème de la crème of Modern Architecture, Spain has it all. So, without further ado and in no particular order, here are our favorite 15 places to visit in Spain. ‘Madrid me mata’ (Madrid kills me) has been the motto since the Movida. The capital city doesn’t have any of the beaches Spain is so famous for and temperatures easily reach 40ºC (72ºF) in Summer. Which is why most people leave, giving the city a different, less hectic feel in the warm months. Nonetheless, Madrid is still well worth your visit. Spend the day away from the unforgiving sun at the Prado, Reina Sofía and Thyssen museums. Then, after sunset, discover a vibrant and unstoppable nightlife - yes, even on weekdays. Barcelona: and this isn’t even the main attraction. Catalonia’s capital is well-known around the world and for good reason. A seaside city with a clear Mediterranean feel, it also sports a somewhat magical atmosphere sponsored mostly by Gaudí’s artworks and modernista architecture. The Sagrada Familia, Park Güell, Casa Batló, La Pedrera are the top sights together with the Ramblas. But you really shouldn’t miss out on the Gothic Neighborhood, Raval’s alternative scene or on the city’s 24 Michelin-star restaurants. Menorca: gin and lobster, anyone? Ibiza and Mallorca are Europe’s biggest party islands. So if you want to enjoy the natural beauty of the Balearic Islands quiet and peacefully, head to Menorca. The bright blue sea is to die for. To top it off, enjoy a glass of Gin Xoriguer with lemonade in the sun. The local cuisine never disappoints: lobster stew is a must try, but you can only have it from March to August. The sun sets over Alhambra, Granada. Fun fact: ‘granada’ also means pomegranate in Spanish. It’s a fun fact, but it also speaks of how important the Arab presence in the city was. A must-see in Granada is the Alhambra, a Moorish citadel and palace, which has been described as a “a pearl set in emeralds”. The intricate details of the moçarabe style and the geometry are impressive: we have yet to meet anyone who wasn’t left completely breathless by the beauty of it. Mérida’s Roman Theatre is still in use. Extremadura isn’t very often mentioned as one of the best places to visit in Spain, but we challenge that. Mérida is the perfect city to dig into our Roman past: there’s a temple, a circus, an amphitheater, houses and an impressive theater which is still in use. To explore Mérida even further, go to the National Roman Art Museum, where you can see all the naked statues you used to find on school history books. More than bullfighting: Sevilla has a lot to offer. Despite having strong remnants of the Caliphate of Córdoba, Sevilla has everything that you associate with Spain. It’s a port city with an historical harbor dating back to the Age of Discoveries, gardens with palm trees, the city council is in an old tobacco factory and flamenco echoes all through the streets. And, finally, head to the city’s UNESCO World Heritage sights or Plaza de España. Lots to see, ¡olé! Toledo is a Medieval city surrounded by the Tajo river. Until 1563, Toledo was the country’s capital. So it’s not surprising that it is one of the best places to visit in Spain if you’re interested in Spanish history. In the city center alone, you’ll find traces of the Catholic, Arab and Jewish presences. Despite existing since the Visigoths and the Roman, you should be prepared to encounter a Medieval, fortress-like city with haunting artworks from El Greco. Not quite what you’d expect from Tenerife: Teide National Park. Off the coast of Africa, the Canary Islands were once thought to be the “furthest” land in the world. A few centuries have passed since then, but they are still one of the best places to visit in Spain. If you’re looking for golden, sandy beaches and rocky mountains, Fuerteventura will quickly become your favorite place. In Tenerife, get away from the tourist-ridden Santa Cruz de Tenerife and discover another side of the island in its natural parks. Bilbao’s urban feel contrasts with a magnificent old town. The largest city in the Basque Country, Bilbao’s biggest attraction is the Guggenheim Museum. This alone makes it one of the best places to visit in Spain, but there’s a lot more!. The old city is a little gem - make sure to visit the original seven streets of the city and hunt pintxos at Plaza Nueva. If you’re travelling with a car, then a day trip to nearby Donostia/San Sebastian is well worth it. When you think of Spain, you probably don’t think about North Africa. As a Spanish exclave in North Africa, Ceuta is a city where different cultures intertwined. It has always been a disputed city, which is why you’ll see forts and fortresses from different time periods and empires: the Mariniad Wall of Ceuta was built by the Berbers, but there’s also the Royal Walls of Ceuta built by the Portuguese. There are Catholic churches but also Mosques, intriguing buildings like Casa de los Dragones and a strong scent of spices in air. The City of Arts and Sciences, in Valencia, was designed by Santiago Calatrava. 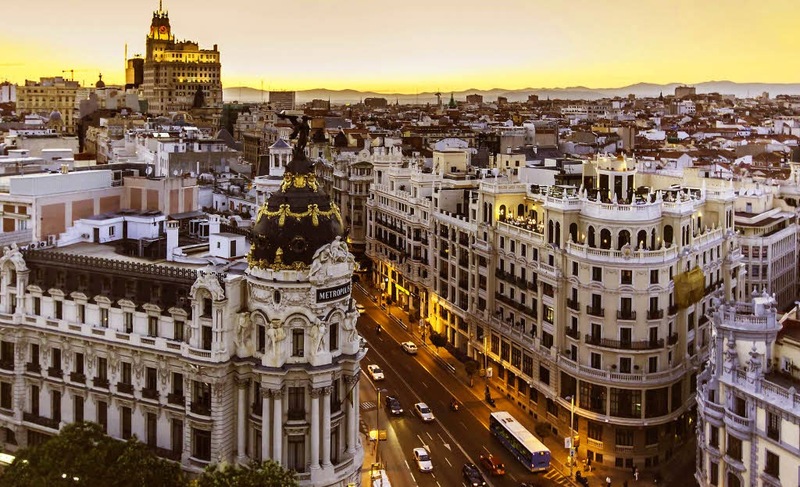 Spain’s third biggest city is like the younger sister who finally blossomed and one of the must-see places to visit in Spain. Overlooked in the years following the Civil War, it’s now a beacon of modern architecture all the while retaining its traditional and familiar feel. It’s also a thriving cultural center: visit the City of Arts and Sciences, the Bioparc, la Lonja and the Central Market in the old City. And don’t forget the paella! Plateresque: the University building in Salamanca. Salamanca is a postcard-like city which is mostly known by its ancient university. The city center, which grows out of Salamanca’s Plaza Mayor (the first of its kind in the country) is built almost entirely in Villamayor stone in Plateresque style. Spend an entire day to visit the Cathedrals, the Old University (can you spot the frog?) and Casa de las Conchas, because if any city in Spain resembles an open-air museum, this is it. Cíes islands off the coast of Vigo, Galicia. Not far from Europe’s biggest fishing fleet, you’ll find untamed, inhabited islands of incredible beauty: the Cíes. Right off the cost from Vigo, you can visit (and camp there) in the Summer months - beware, there’s no running water or electricity, so this is the ultimate camping experience! If that’s not your style, then stay in the city and discover Galicia. Málaga welcomes you to Costa del Sol. Costa del Sol literally means ‘Coast of the Sun’ and that’s where we’re headed next. Málaga is the biggest port city in Southern Spain, a stone’s throw away from famous beaches like Marbella and, according to Lonely Planet, “a lesson in reinvention”. It’s an historical, soulful city that will always try to seduce you with music, tapas and food halls. And did we mention it is Picasso’s birthplace? Getting away from it all: Sierra de Gata. Still untouched by mass tourism and almost unknown even to Spanish people, Sierra de Gata (lit. Cat’s Mountain Range) is a place where time seems to have stopped. You can truly disconnect from everything in small quaint villages like San Martín de Trevejo, which is a well-hidden jewel in the mountains. Make yourself at home at Casa Antolina, grab a bike and dare into the Roman trails. Ready to pack? Check out our essential Spanish travel phrases for your holidays! You can also drop us a message if you would like to learn Spanish online ahead of your tour of Spain! Common Spanish language mistakes even Spanish speakers make!